It was Spring of 1959 and the Chinese occupation of Tibet was in full swing. In the midst of all the turmoil and unease was Sudha Johorey, wife of the political officer in charge of the Indian Mission in Yatung, worried about the state of affairs for her beloved Tibet, the souring relationship between India and China and above all her friend, HH The Dalai Lama who was rumored to have left Lhasa for sanctuary in India. 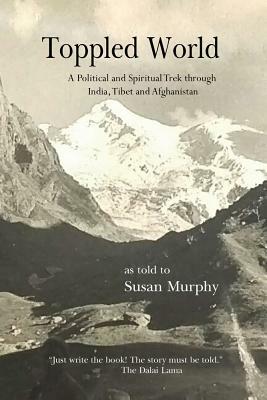 Thus begins the extraordinary journey of a young woman and her unlikely friendship with HH The Dailai Lama, her adventures as a diplomat’s wife across India, Afghanistan, and the jungles of frontier states of her country and her unique and personal journey with the teachings of the Buddha. Susan Murphy is a mother, grandmother, artist, baker, world traveler, and an accidental author. She never planned to write a book, but a chance meeting with Sudha Johorey and His Holiness the Dalai Lama in 2005 led to nearly 12 years of research, interviewing, writing, editing, and countless trips to India—all resulting in Toppled World.